This image depicts a section of road between Dalgety and Jindabyne in the Monaro region of NSW. Prior to the arrival of the first European colonists in the 1820s this region was Ngarigo country. They ranged widely over the region, and (along with members of other language groups who lived around the Snowy Mountains) travelled in summer to feast on Bogong Moths amongst the granite boulders of the high country. As with squatters and settlers in other parts of the colony, the Europeans appropriated the land for their use and instituted a system of land title that ignored any property rights that may have been held by the indigenous people who had lived here for many thousands of years previously. Their right to take ownership in this way was later formalised into the legal doctrine of terra nullius i.e. the principle that the land was vacant prior to their arrival. In this image I simply wanted to draw attention to this notion (which is no longer recognised by the Australian legal system). 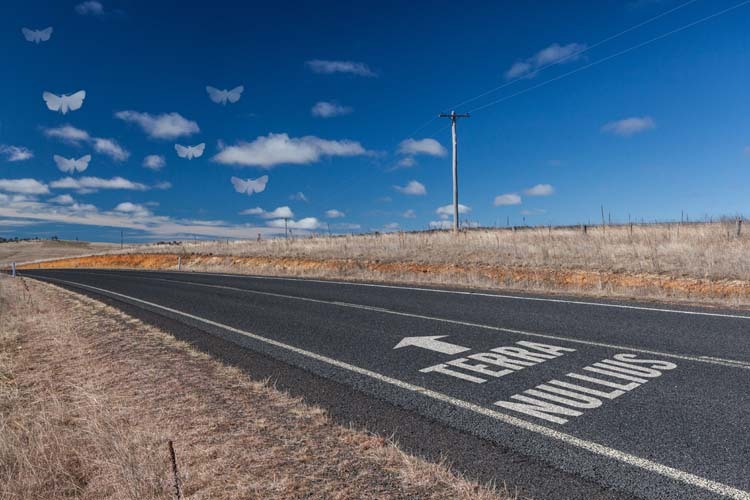 However the road’s invitation to move into the ‘unoccupied’ land is symbolically contested by the Bogong Moth cloud shapes which still look down over the land. The diagonal slash of the road is intended to lead the viewer’s eye from the right foreground (and its text), towards the horizon on the left and up into the moth-clouds.